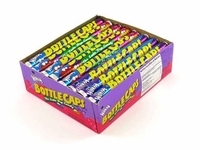 Bottle Caps candy rolls are just one of Willy Wonka most popular candies. These bottle caps are made to look like metal soda bottle caps from years ago. Each roll has 5 great soda pops flavors. Bottle caps have a generally sweet but slightly sour taste to them similar to a sweet tart. In the past, Bottle Caps contained a lemon lime flavor which was replaced with cherry flavor. Each box has 24 1.77 oz. rolls per box.